Everyone knows the cartoon about colorful ponies “My Little Pony: Friendship Is Magic”. The cartoon’s characters are also well-known. The main character is a pony Pinkie Pie who introduces the audience its world. 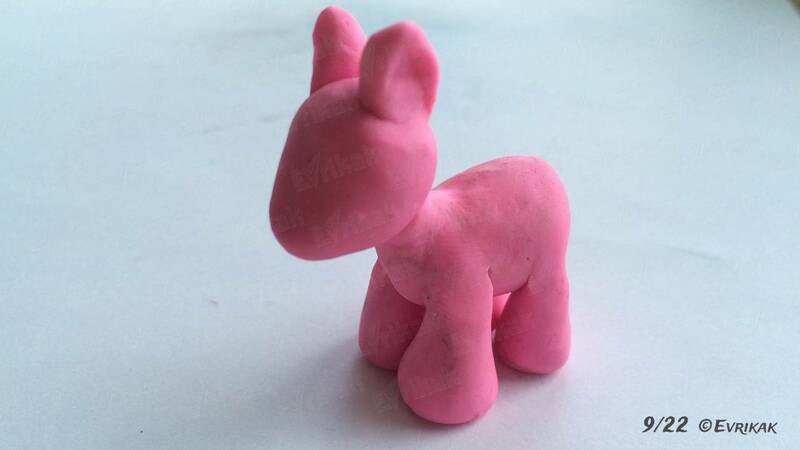 So we’ll show you how to make the horse with the help of plasticine. 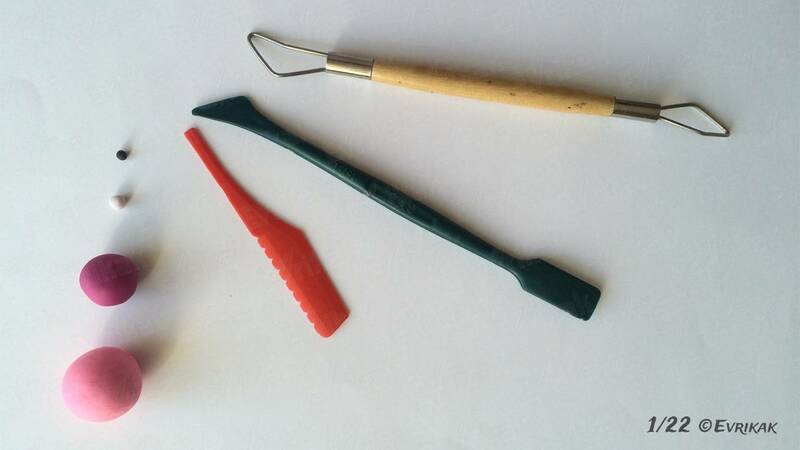 These classes are very interesting for the child, moreover, they help to develop hands fine motor skills. 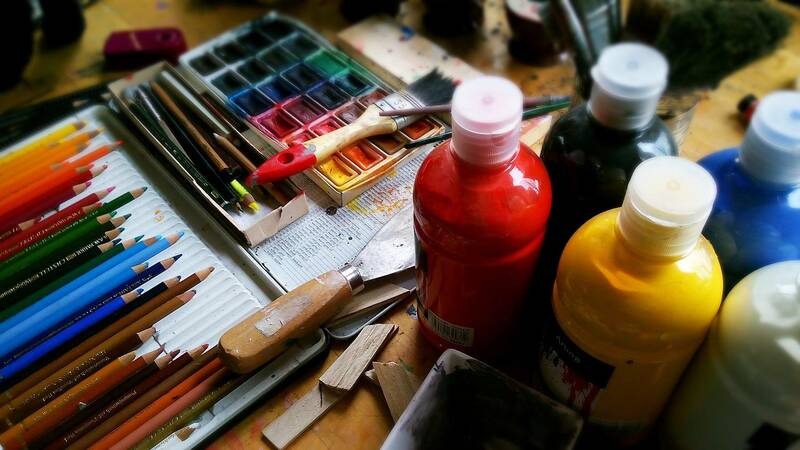 Preparing for modeling, you can prepare the colored plasticine together with your child which will not harm the health of the child during the modeling process. First of all, prepare everything you need for the process. 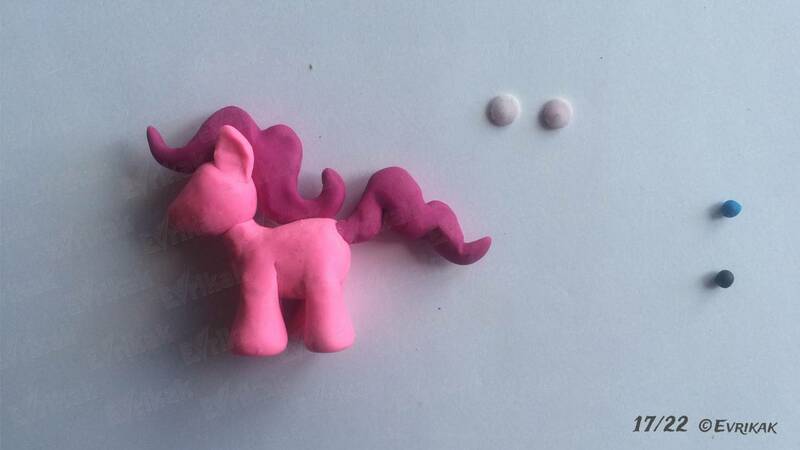 You will need a large piece of light pink plasticine, a smaller piece of dark pink plasticine and the tiny pieces of white, black and blue ones. Don’t forget the knife and the stacks. 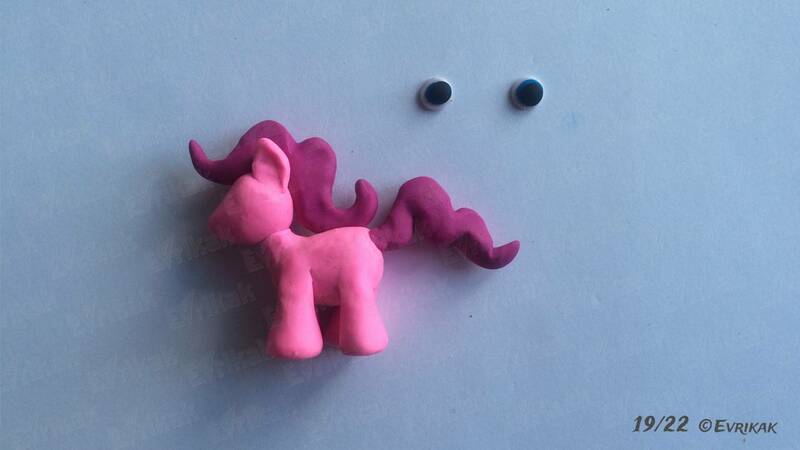 They will help you to create the parts of the pony such as the ears or the mane. 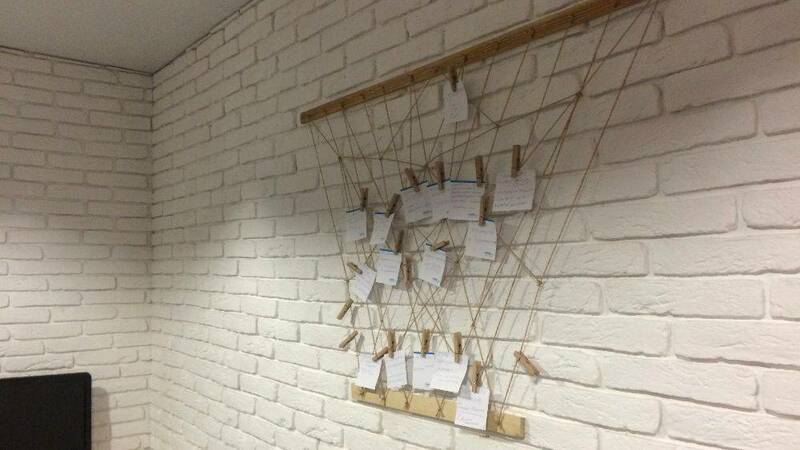 Put everything you need on the modeling board or on a piece of paper not to stain the table. 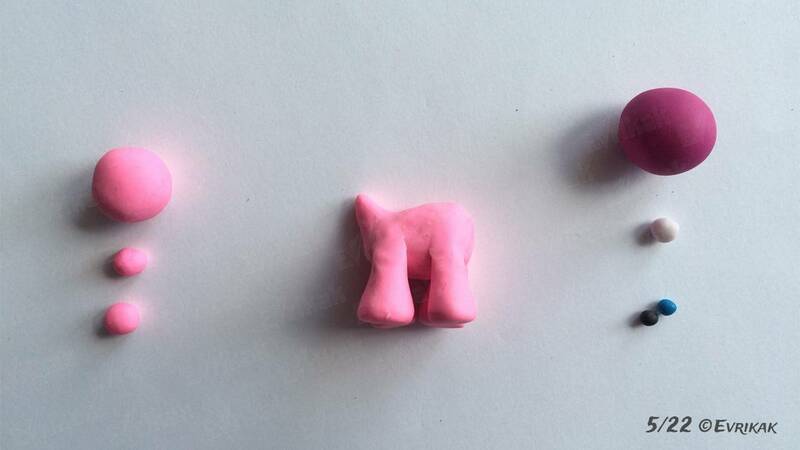 Divide the light pink plasticine into nine parts. The first four parts should be of the same size. Form the round pyramids out of them. 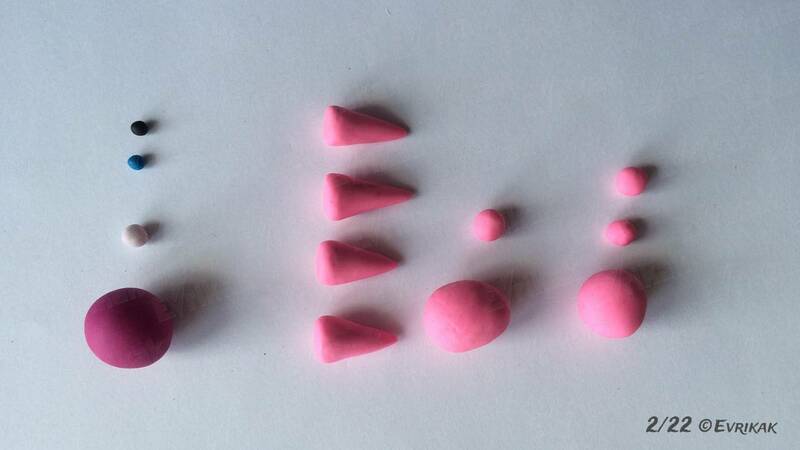 Also form two balls of medium size and three small balls. Make the body of the pony of one large and one small ball. It’s oval, it ends with a triangle from one side – it’s the neck . Form the neck of a small ball. When connecting the parts, smooth the unevenness using the stack. Flip the body to make the neck be on the top. Attach two pyramids to the lower left part. They should be widened smoothly that’s why you shouldn’t clamp them too hard to the body. Attach the remaining legs to the right side. Pay attention that the legs must be on the same level. Don’t forget to smooth the connection lines using the stack. 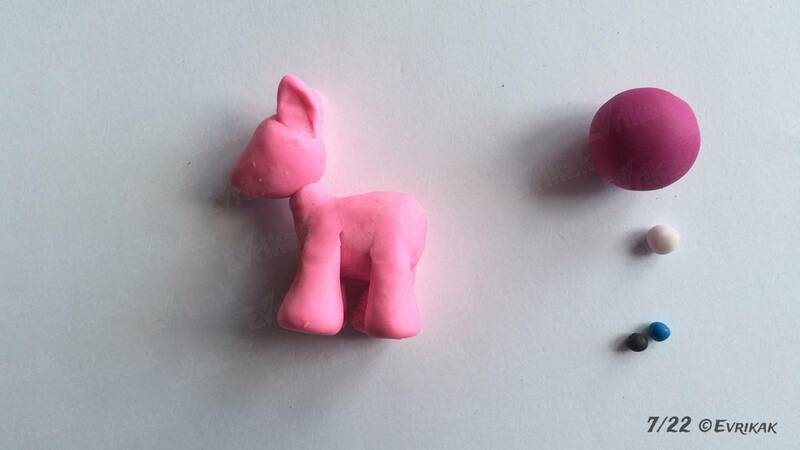 Make the head using the remaining light pink piece of plasticine. 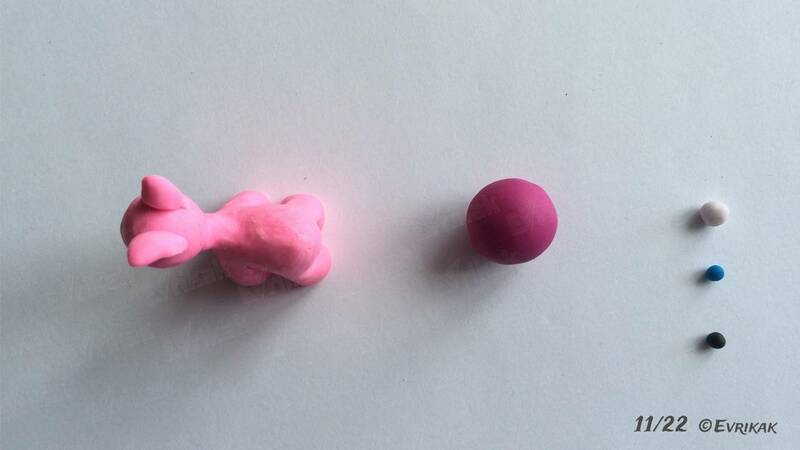 Make a large ball of plasticine longer from one side, forming the muzzle. 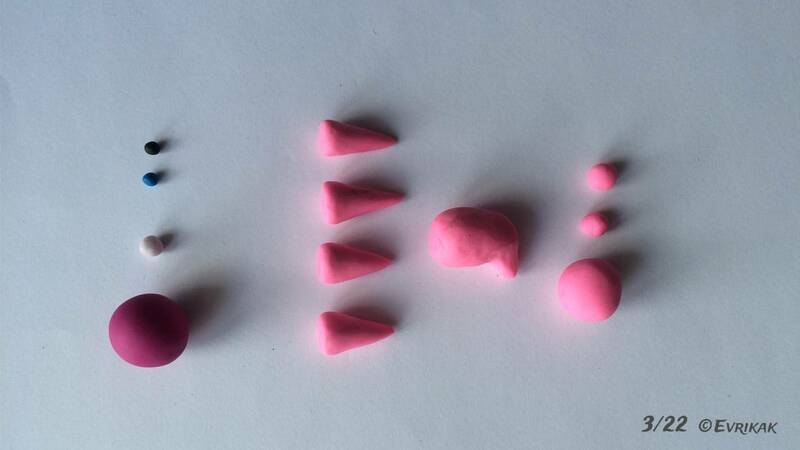 Make the ears in the form of triangles using the small balls of plasticine and connect them with the head. Now connect the pony’s head to the body. This should be done carefully not to spoil the shape of the parts. Also, the you shouldn’t clamp the head too much because the neck will be very short then. 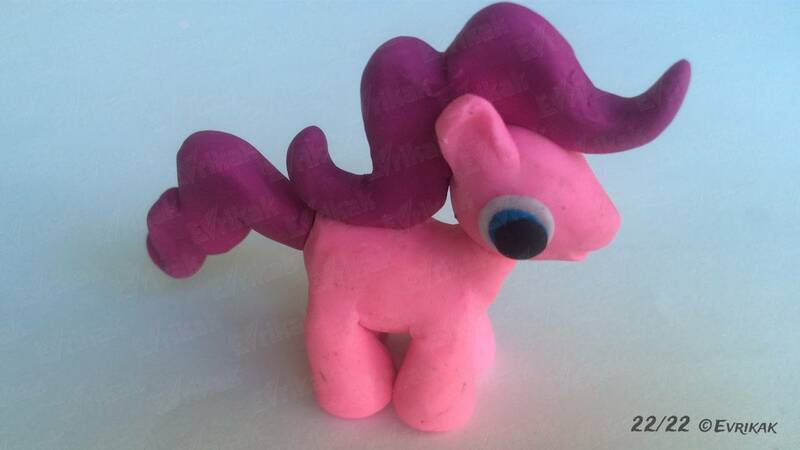 At this stage, examine the body of Pinkie Pie. 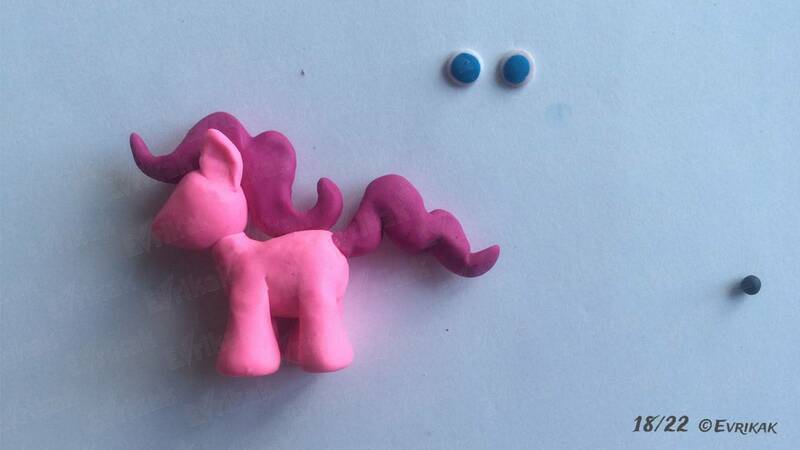 Put the pony on a flat surface. The horse should stand straight. If it wobbles, adjust the legs. Check the connection lines to prevent the parts from accidental disconnection. Start making the following parts. 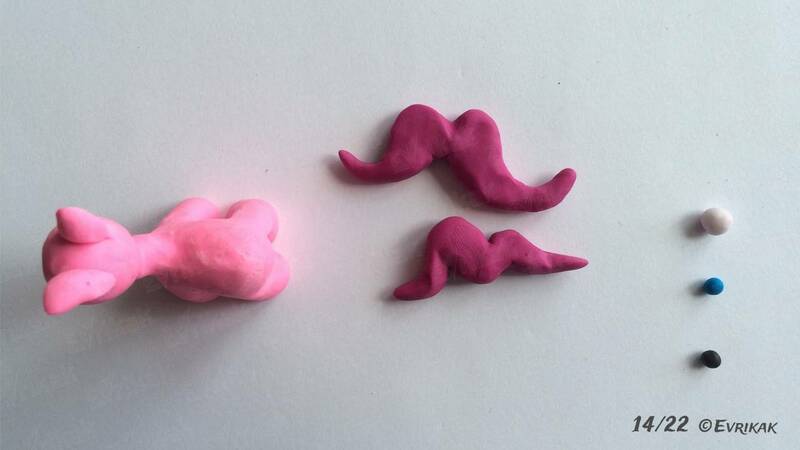 We need a dark pink piece of plasticine. 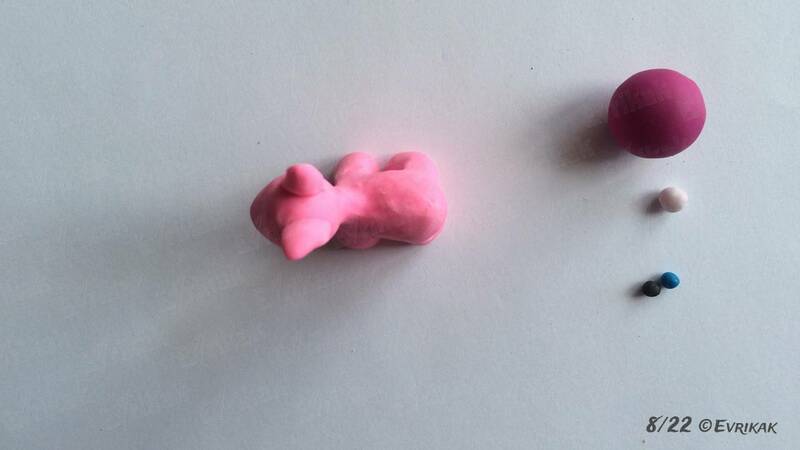 We divide this piece of plasticine into two parts. One piece can be bigger, we will start making a mane of it. 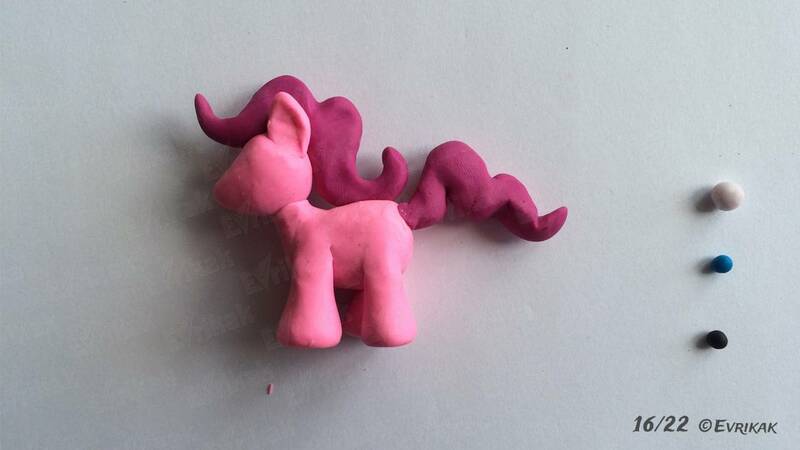 Make a mane of one piece of plasticine. 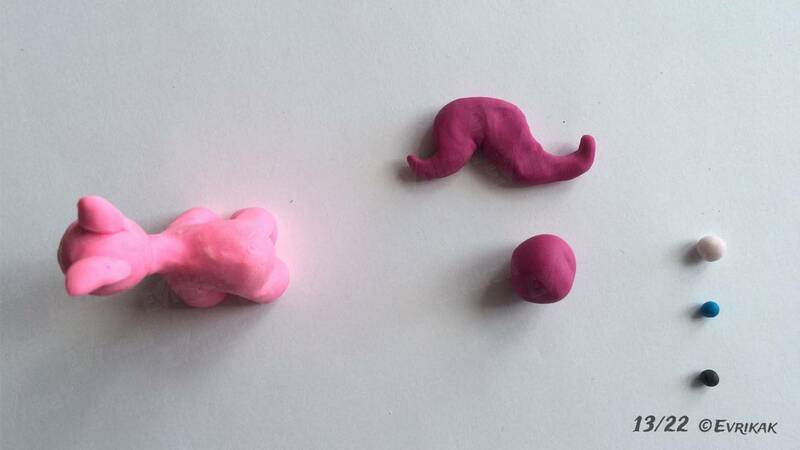 It looks like a twisted mustache, only the left part is shorter because it’s afringe of Pinkie Pie. The right side should be of the same length as the neck. 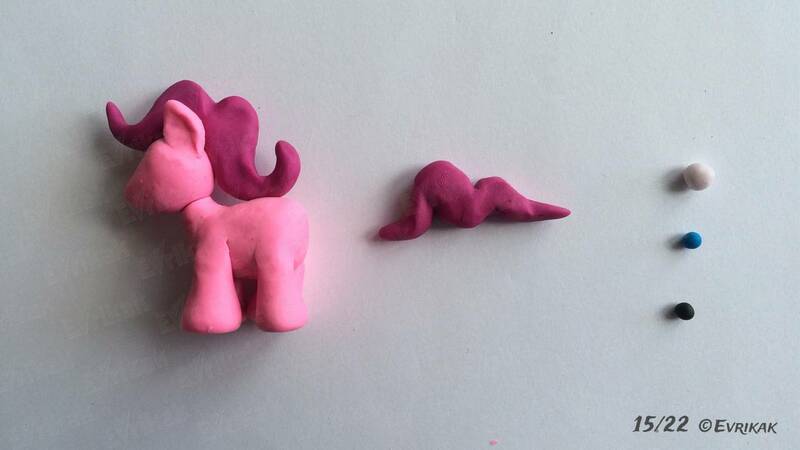 Transforme the second piece of plasticine into a tail. It’s wavy, it’s twice twisted. The first twist is bigger than the second one. Attach the ready made mane to the head. The lower part of the mane must lie on the back. You can press slightly to attach the part. 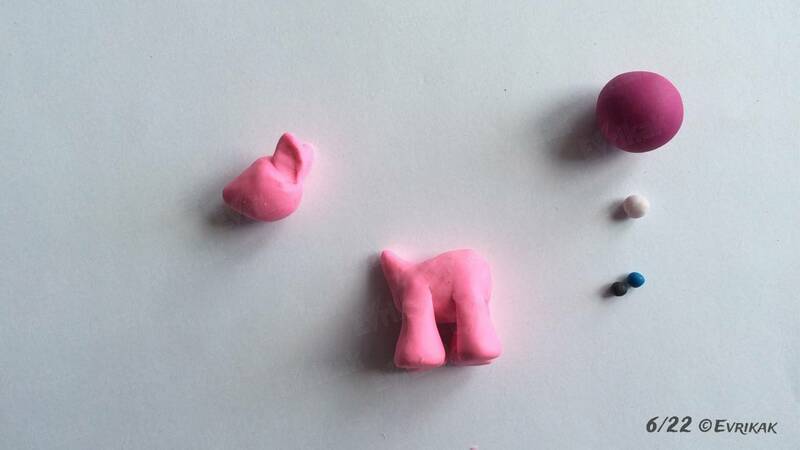 Attach the tail to the body of the pony. 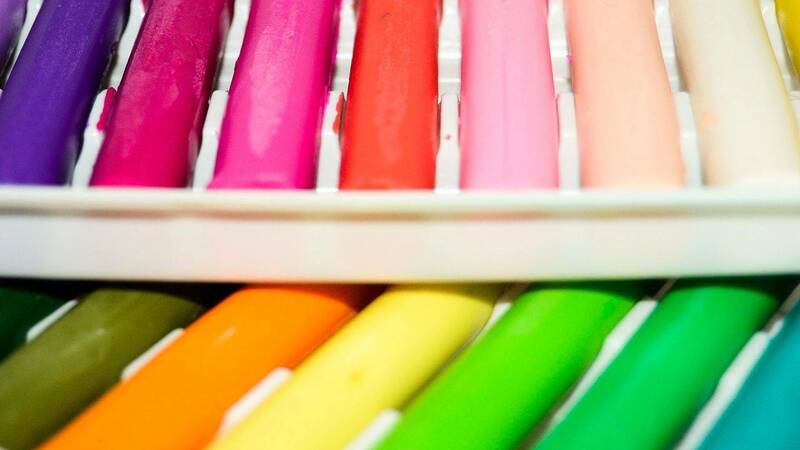 Don’t smooth these details because the colors of plasticine will mix up. Start making the last part – the eyes. 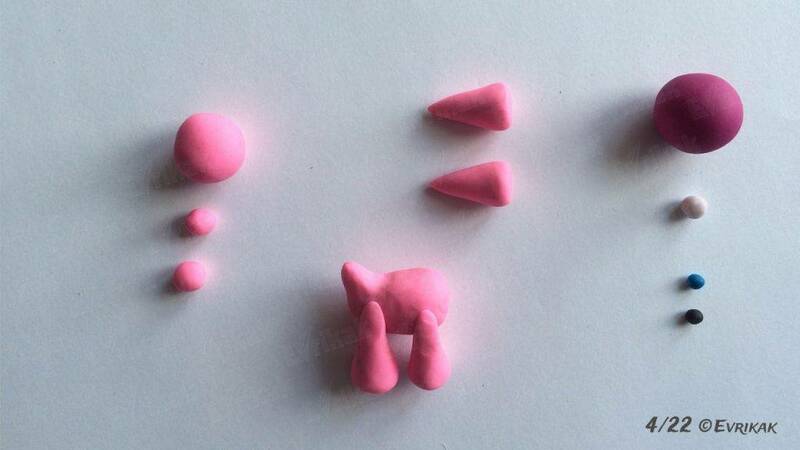 Divide the white piece of plasticine into two parts and form small eyes. 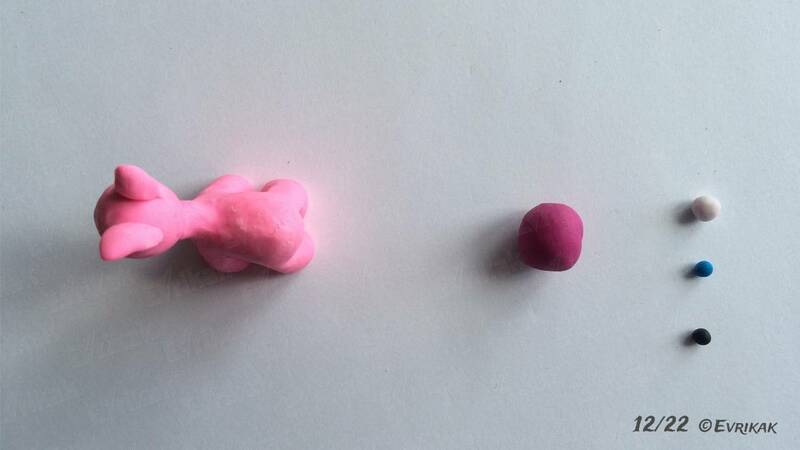 The blue piece of plasticine is also divided into two parts. These parts should be smaller and must be placed on the white plasticine. 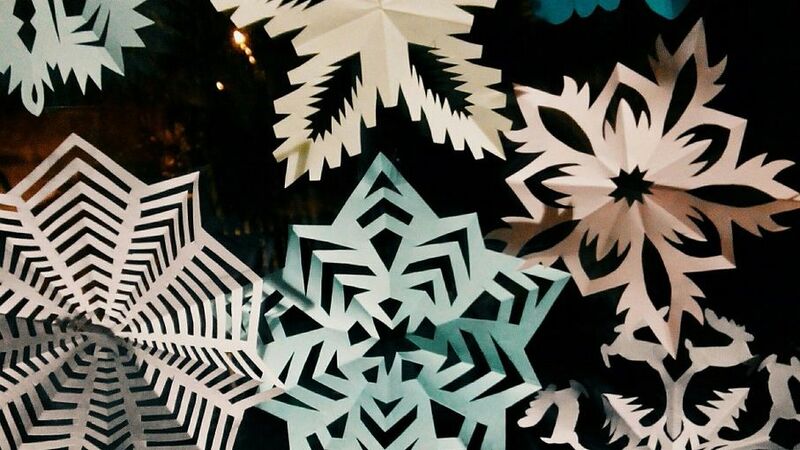 The white color should be visible. 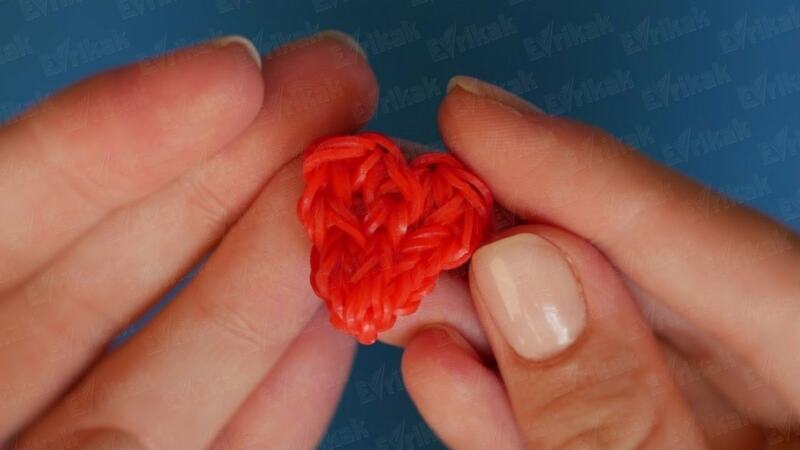 Put small pieces of black plasticine on blue ones. The eyes will be voluminous. 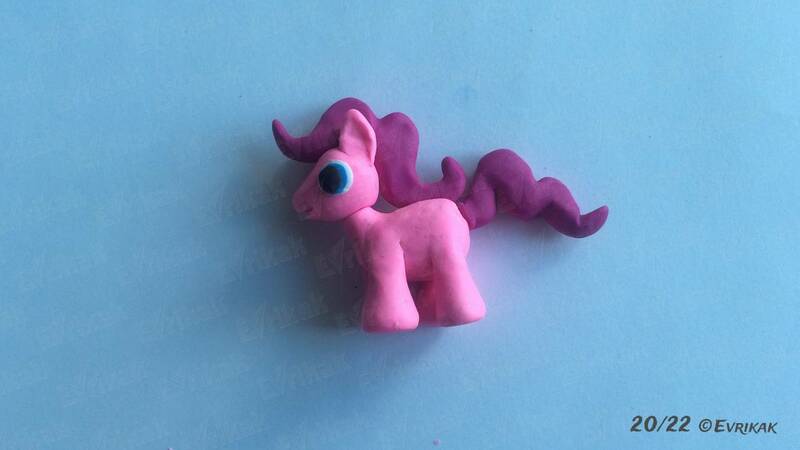 Attach the eyes to the left and to the right on the pony’s head. Using a knife or a stack, form a nose and a mouth of Pinkie Pie. This should be done carefully not to damage the head. 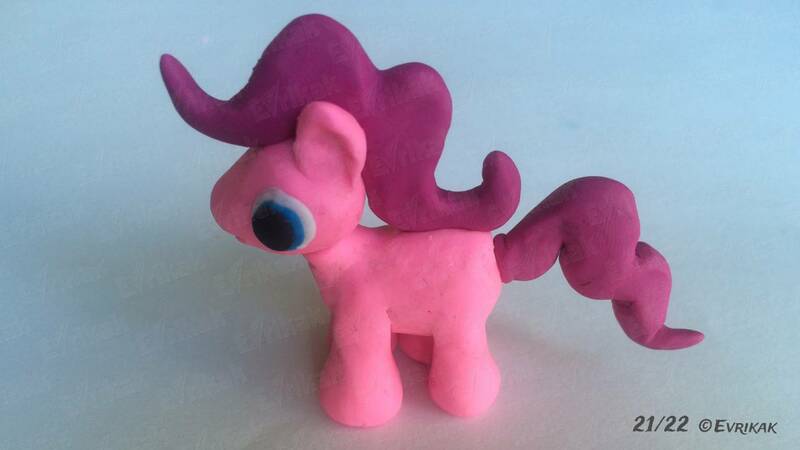 Pinkie Pie is ready. Check the connection details again, especially the eyes, the mane and the tail. 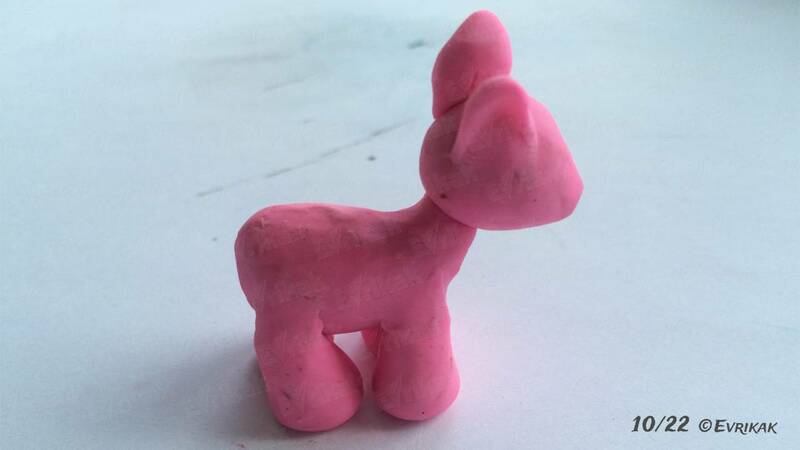 The next time you can watch your child making the pony by himself or herself.